The painters of the Eastern Kimberley are renowned for their use of ochre. Ochre is a tactile medium: pigments are collected, crushed and mixed by the artists to create a luscious array of earthy tones. Senior painters who have mastered the use of ochre, such as Freddy Timms, Rover Thomas, Paddy Bedford, Queenie MacKenzie and Rusty Peters are easily differentiated from their contemporaries from Central Desert or Western Australia where colour, dreamtime and dots dominate practice. 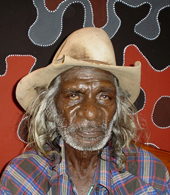 Rusty Peters is a senior Gija man of Juwurru skin. He was born in 1934, under a Warlagarri or Supplejack tree on Springvale Station south west of Turkey Creek. Local tradition dictates his spirit came from a crocodile his father had killed when his mother became pregnant. The land and the myths of his birthplace (and home) continue to inspire the majority of his works. Like most senior East Kimberley artists, Peters spent his years before painting working as a station hand. A skilled rider and horse breaker he was never short of work from the large cattle and sheep stations in the top end. However, the introduction of award wages in the 1970s resulted in the dislocation of many station hands. Rusty Peters moved to Warmun Community and became involved with the community school and was instrumental in the development of its cultural and bilingual syllabus. In 1989 he moved to Kununurra where he was employed at Waringarri Aboriginal Arts as an assistant. It was there he met and formed a strong friendship with the artist Rover Thomas. Peters initially worked on small canvases, but as his competency and artistic skill increased he worked with larger format painting. By 1997, the artist had joined Jirrawun Arts (the centre established by Freddie Timms) and became known as one of its leading practitioners. Respected Aboriginal gallerist, William Mora represented the artist in Melbourne and Sydney audiences were exposed to his work via Grant Pirrie gallery. In 2002, the artist completed a successful painting collaboration with New Zealand artist Peter Adsett, entitled ‘Two Laws… One Big Spirit’. Peters also painted the completion major 8 panelled work titled, Waterbrain, which was purchased by the Art Gallery of NSW. These two key events, supported by a major body of work, culminated in the validation of Rusty Peters reputation as a major Australian artist. The current work, THOOLOOMBOON COUNTRY, 2003 is a fine example from this period. One of only six major canvases from the artist’s 2003 solo exhibition at Grant Pirrie Sydney, this beautiful painting captures specific themes of Gija country and culture in a bold ochre palate.